Studio’s FTP server can be used to upload lists of subscribers which can then be imported into either Mailing Lists or Suppression Lists. The domain name portion of the URL that you visit when logging in to GreenArrow’s web interfaces. 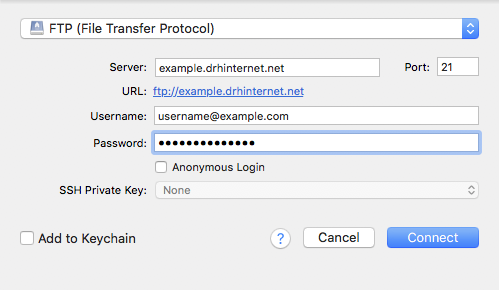 For example, if you login to GreenArrow Studio at https://example.drhinternet.net/ga, then the server name to use is example.drhinternet.net. The same as what you use for GreenArrow Studio’s web interface. If your FTP client has a STARTTLS option, then we recommend enabling it, but this is not required. Server - the domain name portion of the URL that you visit when logging in to GreenArrow’s web interfaces. Username - the username that you use to login to GreenArrow Studio’s web interface. Password - the password that you use to login to GreenArrow Studio’s web interface. pure-ftpd.pem - the PEM-encoded certificate chain bundle to use for TLS. See Pure-FTPd’s README file for a list of available arguments.